Milk kefir is one of the healthiest and easiest fermented beverages you can make yourself. Fermented drinks, and foods, are among the latest trends in superfoods. Fermentation is a natural process, one that humans have been manipulating and benefiting from for millennia. Fermented foods and drinks are rich in probiotics, those helpful microorganisms that work in your digestive tract to improve your health in a number of ways. Not all fermented products, pickles for instance, are appropriate for smoothies, but many are. Once you have learned about kefir, kombucha, Hindu lemonade, and other tasty fermented drinks you will definitely want to craft smoothie recipes around them. Chemically speaking, fermentation is a type of reaction. There are two main types of fermentation: ethanol and lactic acid. Ethanol fermentation is the secret to making spirits, wine, and beer. Yeast, which is a microorganism, consumes glucose, the sugar found in grains and fruits, and produces ethanol. The alcohols created by this reaction are some of the oldest fermentation products in the world. For thousands of years the combination of grapes and yeast has been supplying people with wine, while the mix of grains with yeast makes either beer or liquor. The other kind of fermentation produces our fermented foods and non- or barely-alcoholic fermented drinks. Lactic acid fermentation occurs when microorganisms, often the Lactobacillus bacteria, consume sugars, like glucose, sucrose and lactose, to produce lactic acid. The production of lactic acid imparts a sour flavor to fermented foods like pickles, sauerkraut, and plain yogurt. Drinks fermented in this way are also sour. What’s the Deal with Probiotics? The term probiotic is a trendy one in health foods and supplements and it is the key to the rich nutritional benefits of fermented foods and drinks. It may seem as if fermented products would not be good for you, considering they are made by allowing bacteria and yeast to degrade food, but it turns out that these microorganisms can do wonders for your health. When humans first began fermenting thousands of years ago, the motivation may have been to preserve foods, but the health benefits were also noted. The beneficial microorganisms that populate fermented foods are today called probiotics and they include different types of bacteria as well as yeast. It all starts in your gut. Gut is, believe it or not, the correct medical term for your small and large intestines. And your gut is teeming with bacteria. It has been since you were born and as you have grown you have developed a very important ecology of bacteria living in your gut, and throughout your body. In fact, if you are a healthy adult the bacterial cells living in and on your body should outnumber your own cells by ten to one. The microorganisms living in your gut help to digest your food, fight off infecting pathogens, and even affect your brain and your mood. Probiotics are the living microorganisms that you consume with food that enhance your existing gut ecosystem. They are found in fermented foods and drinks, but can also be taken in the form of a supplement. Research from numerous studies indicates that you can improve your gut ecosystem, and therefore your health, in a number of ways by eating more probiotic-rich foods. Studies are even showing that certain disorders, and even obesity, could be caused by a poor gut ecosystem. What Can Probiotics Do for You? Dental health. The bacterium called Lactobacillus reuteri, which participates in the lactic acid fermentation process, kills the bad bacteria that cause tooth decay and gum disease. Diarrhea prevention. Diarrhea is a common side effect of taking antibiotics because the medication kills the healthy bacteria in your gut. Consuming more probiotics can keep your gut healthy and prevent episodes of the runs. Reduce respiratory infections. Exactly how they do it is unknown, but probiotics in the gut seem to reduce the incidence of respiratory infections like the common cold. Lower blood pressure. The bacterium Lactobacillus reuteri has been shown in studies to lower blood pressure in participants when compared to a placebo. Prevent eczema. The itchy, uncomfortable skin condition can be prevented in babies when their mothers take probiotics during pregnancy. Soothe the bowels. A number of digestive disorders may be treatable with probiotics. Evidence suggests that consuming more probiotics can help treat irritable bowel syndrome, intestinal infections, gastroenteritis, and even the inflammatory conditions Crohn’s disease and colitis. Brain health. One of the latest and most exciting areas of study with gut bacteria is linking the gut ecosystem to the brain. Research overwhelmingly shows that what lives in your gut effects the development and structure of your brain. The gut is often referred to as the “second brain” and we’ve all been told to “trust your gut” or “go with your gut” when making an important decision. It’s estimated that 50% of our neurotransmitters are produced in the gut, including most of our serotonin, the feel good chemical. Now that you know just how important your gut ecosystem is, surely you want to start supplementing your diet with fermented foods and drinks. If sauerkraut and pickles aren’t for you, you have plenty of other options. There are a number of fermented drinks that you can add to smoothies for a nutritional and flavorful boost. Many are easy to find at health food stores and not difficult to make at home. Kefir. Kefir is a fermented drink, which in its traditional form, is very similar to yogurt. It is made by fermenting milk using both yeast and bacteria. The flavor is like yogurt, but the consistency is thinner. Kefir can also be made using coconut milk, or even just water, instead of milk. 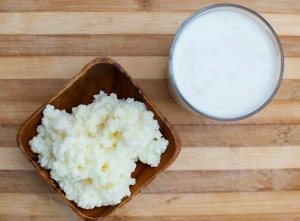 Either type of kefir is easy to make and is a great starter project if you have never made a fermented drink. Kombucha. This fermented tea has been a big buzzword in health foods over the last several years. Kombucha starts with a mother culture of bacteria and yeast known as a SCOBY (symbiotic culture of bacteria and yeast) that, along with added sugar, begins the fermentation process. Kombucha’s flavor ranges from slightly sour to fully sour, depending on what is added to it and how long it is left to ferment. Jun Tea. A fermented tonic made with green tea and honey that’s similar to kombucha. The history of Jun tea is a bit fuzzy. Stories claim it’s an ancient spiritual elixir that originated from the Himalayas where it was brewed by monks and spiritual warrior nomads in Tibet. Think of it as kombucha lite. For more information on Jun tea and instructions to brew your own, click here. Kvass. Kvass is a traditional fermented drink of Russia that is typically made with bread as the fuel for the microorganisms. The flavor of traditional kvass is similar to beer, but the alcohol content is minimal, lower than a half a percent. Kvass is sometimes flavored with fruits or sweeteners. It can also be made with vegetables, such as beets or carrots, instead of bread. Beet kvass has become quite popular in recent years. Fermented soda. Instead of buying overly sweetened pop from the store, you can make your own delicious fermented sodas at home. It’s easy to find recipes for homemade orange soda, ginger ale, root beer, lemon lime soda, and others. Most require a just a few ingredients including fruit or other flavoring agents, water, sugar, and either whey or a starter culture. Hindu lemonade. Instead of store-bought lemonade packed with sugar, try making a fermented drink called Hindu lemonade. The simple recipe includes whey, sugar, water, and lemons (or limes for limeade). Rejuvelac. Rejuvelac is a drink made from fermenting sprouted grains. It is as simple as sprouting the grains, soaking them in water, and waiting for the fermentation to happen. You can use any grain including rye, wheat, oats, barley, quinoa, and others. In addition to the probiotics this drink is also rich in vitamins because of the process of allowing the grains to sprout. Plain yogurt. While not technically a beverage, yogurt is a fermented food that provides you with probiotics and which makes a good addition to smoothie recipes. You can make your own yogurt or buy it from the store. Opt for full-fat yogurts and be weary of flavored yogurts that are often loaded with sugar. Seven Stars Farm offers an organic, probiotic rich yogurt. It is important to remember that all of the above drinks, although fermented, are not alcoholic. Most may contain trace, insignificant amounts of ethanol, but all are safe for people of all ages. If you continue to research fermented beverages and recipes for making them at home, you might come across claims that these drinks can be harmful. The risks are said to be infection by harmful microorganisms that may contaminate the cultures of probiotics used to make the drinks. Whenever you are dealing with bacteria and yeast you do need to be careful, but the risks when brewing your own fermented beverages are extremely low. Make sure you sterilize all the kitchen equipment you are using before starting a recipe to avoid contamination. Also, be sure to buy starter cultures from reputable sources. There are several attractive reasons for making your own ferments. It’s less expensive, the resulting ferment is richer in probiotics, you control the ferment (resulting taste and texture), and it’s fun! If you’re brand new to this, pick an easy one, such as kefir, and ferment away. There are numerous sites with instructions for making the various fermented beverages. The site below is the best resource I’ve come across thus far. In my article on good fats vs. bad fats I stated that eliminating the bad fats and incorporating plenty of the good fats into my diet was the single most important thing I’ve done for my health. Including plenty of fermented drinks and foods into my diet is perhaps the second most important thing I’ve done for my health. I make kefir, kombucha, and sauerkraut on a regular basis and experiment with other ferments when time permits. What is your experience with fermented beverages and foods – consuming, making, health benefits? Please leave a comment below. I think you’ll really like kombucha, Jacob.